I created Fearless to celebrate the incredible women in all of our lives. Starting with rough sketches I experimented with bold colour and different lettering styles before scanning and vectorising the lettering. Fearless is inspired by and reflects the strength of women past and present who continually fight for women's voices to be heard. This print is limited edition and will not be around forever. 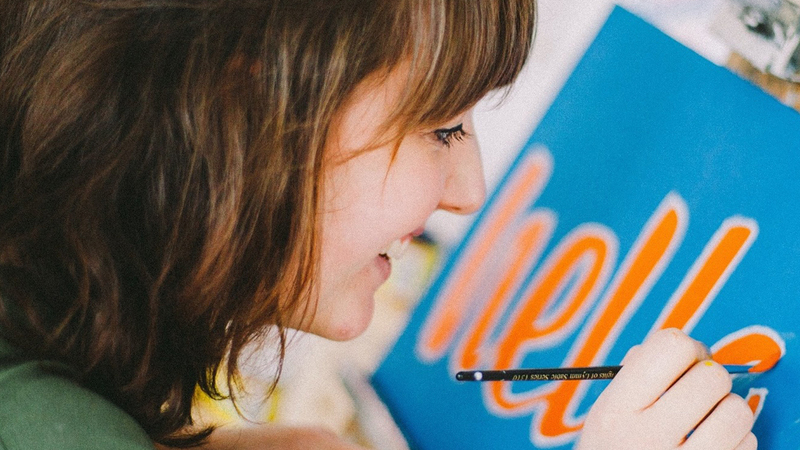 I'm a lettering artist and signwriter based in Glasgow, Scotland. I studied at Edinburgh College of Art and Massachusetts College of Art and Design, graduating in 2016. I did an apprenticeship with Ciaran Globel of Globel Bros Signs before starting my own business in June 2017. I am now based in the South Side of Glasgow where I work somewhere in between art, design and craft – which I find very exciting. I love what I do because every brief is completely different and I continually learn with every project. Tell us a fun fact about you. I used to be a competitive fencer and was once second in Scotland. I stopped when I went to art school but I hope to get back to it one day! Top three clients you've worked with? Innes & Gunn, TRNSMT Festival and the SNP – they were all completely different projects but all gave me direction but also creative freedom. How did you get into illustration? I wouldn't call myself an illustrator as such, but I got into lettering from doing a course called Hand Lettering for Design when I studied in Boston and it really changed my life! What tools (digital or not!) do you use to create your work? I usually do a lot of sketching of layout and lettering styles, so a good old fashioned pencil, rubber and fine liners. Set squares and French curves are also really helpful for consistency. If its for a painting I do it full scale, transfer it to my surface then get painting. If its digital then I scan in my final piece, vectorise in Illustrator and play around with colours as I go! Who or what inspires you the most? I love design books – especially ancient typography books and specimens. I find instagram really inspiring too for what others are up to. I also love traveling – Italy is the best when it comes to going on type safari and I love Lisbon for its vibrancy and colours. What's your favourite website for inspiration? I spend huge amounts of time on Instagram. It really is the place to connect to other signwriters and lettering artists, and its all so fresh. I love it! What would your dream project be? The absolute dream is to be given a phrase and a huge wall in a nice warm country to paint – I'd love to be let loose with colour and style!